If your idea of a ranch is a pine forest, the Ranch at Breckenridge is for you. This small neighborhood has the wide-open spaces and the secluded feeling of a rural ranch without any of the struggles the first settlers encountered. 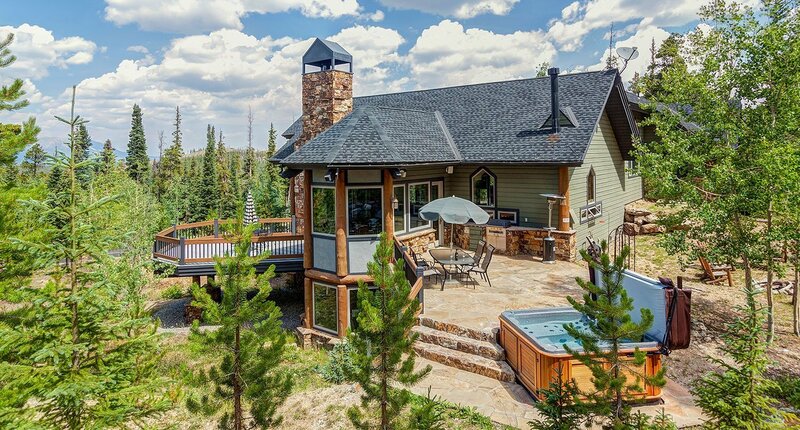 All are custom-built single-family homes on the western shoulders of Baldy Mountain, and this location high above the town of Breckenridge is opportune for taking in the sunsets over the Breckenridge Ski Resort. First platted in the 1990s with just a handful of exclusive lots, homes for sale in the Ranch at Breckenridge will be newer construction and easily accessed by an improved Sallie Barber Road. Take advantage of stellar views of the Blue River valley, the Continental Divide and the Tenmile Range while being minutes from the civilization that a booming ski town offers (craft beer, a distillery, boutique grocers, ski lifts, groomed trails, bike lanes, free public transportation, library, art classes). Mountain luxury is what these custom-built homes evoke, with the toned down quality that Breckenridge exudes. There is often a nod to the heritage of the mining era, and sympathy for the natural environment. The popular trail up Baldy Mountain begins just above homes in the Ranch at Breckenridge and the Sallie Barber trail that joins a vast network of Breckenridge open space can be reached from the back door of many of the homes in this neighborhood. Downtown Breckenridge is a 5-minute drive, or a free bus ride, and the national forest or other public lands are a few step or a quick peddle away. The main trail up Baldy Mountain leads to the Iowa Mill that was the last-to-close ore crushing operation in Summit County, and remains a good example of the mining era. From the main trail one can reach the summit of Baldy Mountain or head off on several spurs that connect to Boreas Pass and French Gulch roads. The trail is popular with hikers, mountain bikers and cross country skiers, and a herd of mountain goats, pikas and ptarmigans. Size: 4,282 sq. ft. to 7,023 sq. ft. Amenities: views, views, views, and easy access to national forest, sunny, newer construction, large lots, forested setting, near free town bus. From the traffic circle on the north side of Breckenridge, continue on Highway 9 by proceeding on Park Avenue. After 1.5 miles Park Avenue rejoins Main Street at a 3-way stoplight. At the following stoplight turn left on Boreas Pass Road. Continue up Boreas along switchbacks with incredible vies, and take a left on Baldy Mountain Road. This road will travel straight toward the base of Baldy Mountain you'll turn on Sallie Barber, or find the Ranch at Breckenridge home for sale off the main road. Are you ready to discuss your real estate opportunities in The Ranch at Breckenridge, or any other Breckenridge neighborhood? Contact us today!